(Left to right) SatSure's Amardeep Sibia, CropIn's Krishna Kumar, AgNext's Taranjeet Singh Bhamra. Leap India's Anurag Malempati, Vasudevan Chinnathambi of Ninjacart, and Omnivore's Jinesh Shah. 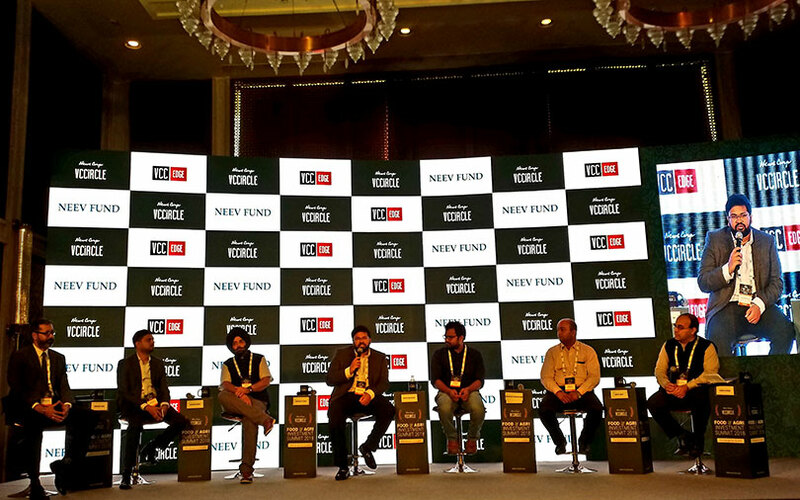 The Indian farm sector should be digitised to bump up agricultural productivity and rural incomes, said panellists at News Corp VCCircle’s Food & Agri Investment Summit 2018 held in Mumbai on Thursday. The panel themed ‘Lending a hand to agriculture’ was moderated by Gaurav Kapoor, senior private sector development adviser, UK Department for International Development. The panel comprised SatSure Ltd chief executive officer (CEO) Amardeep Sibia, CropIn Technology Solutions Pvt. Ltd founder and CEO Krishna Kumar, and AgNext Technologies Pvt. Ltd CEO Taranjeet Singh Bhamra. Others on the panel were: Leap India Food & Logistics Pvt. Ltd founder and CEO Anurag Malempati, Ninjacart co-founder Vasudevan Chinnathambi, and agri-tech venture capital firm Omnivore (earlier Omnivore Partners) founding partner Jinesh Shah. The panellists discussed methods to improve India’s farm productivity. “Farmers are investing and using better technology. We need more of it that will help, for instance, in better price discovery and compensation for the farmers. There are WhatsApp groups that give farmers real-time information. Also, many companies are using such tools to disseminate information about seeds, fertilisers and other input materials,” Chinnathambi said. Shah said that various government initiatives and deeper 4G penetration, brought about by Jio Infocomm’s cheap schemes, will play a vital role in the digitisation of agriculture. Bhamra opined that the use of technology is critical. A 0.5 times change in the farmer’s income would lead to a five times change for the overall ecosystem, he said. Sibia said it is encouraging to see that state governments are the biggest buyers of agri-technology. He cited the example of a cyclone that hit Odisha and Andhra Pradesh and said that insurance companies were able to compensate farmers in two weeks, which otherwise would have taken months and even years.